Ganesh Chaturthi is one of the most famous festivals in India and is celebrated with great enthusiasm by Hindu devotees and others all over the country. This year, this highly revered festival falls on 13th September and people are eagerly waiting for the day. The festival is celebrated as an anniversary day as it is believed to be the day when Lord Shiva gave his son, Lord Ganesha, an elephant head and declared him to be the most superior god. Therefore, every year on Ganesh Chaturthi people worship Lord Ganesha and honour him by performing dances and other religious activities. Pune is one of the few cities in Maharashtra where one can witness the beauty of this celebration at its peak. So, if you are in and around Pune, you must not miss visiting the following Ganesh temples. Read on to know more about these temples. Being one of the Ashtavinayakas, Chintamani Temple is a very popular religious site in Maharashtra. Located at the conflux of Bhima and Mula-Mutha rivers, this beautiful temple is visited by thousands of Hindu devotees every year. It is also considered as a pilgrimage site amongst several Hindus. Even though the exact history of the temple is still unknown, it is believed to have been established in the Medieval Period of time. However, the current building of the temple is built in the recent times. It is located at a distance of about 22 km from the centre of Pune. 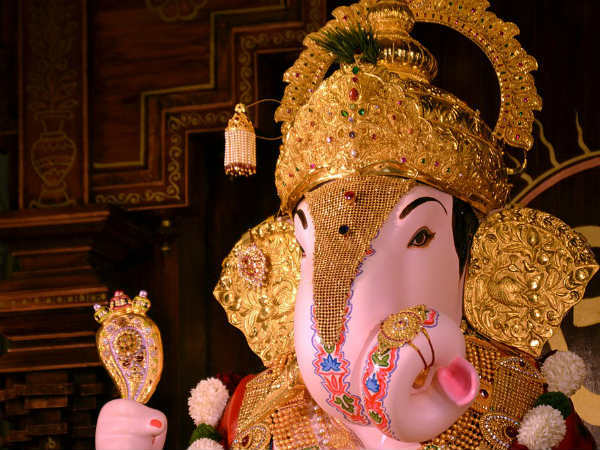 One of the newly built temples in Pune, Dashabhuja Ganapati Temple is another place where Ganesh Chaturthi is celebrated with utmost dedication and devotion. It is popular amongst locals for its evening arti, when hundreds of devotees throng the temple and participate in the worship. Apart from savouring its godly environment, you can also explore the architectural beauty of the temple. The temple harbours a peaceful atmosphere, and hence makes for a perfect spot to get lost in godliness. So, what do you think of a visit to this divine and serene temple? One of the oldest and most frequented temples in the city, Dagadusheth Halwai Ganapati Temple has a history stretching back to the late 19th century. It was constructed by Dagadusheth Halwai, who was a confectioner. The temple is believed to be the site where Ganesh festival was celebrated by thousands of devotees for the first time in the city. Such is its reputation that it is visited by several celebrities as well as well-known politicians. If you are really looking forward to witnessing the grandeur of Ganesh Chaturthi, then you must visit this temple. The temple is known for its 7-feet Ganesh idol which is coated with gold. Another significant temple which is known for its religious as well as historical significance, Kasba Ganapati Temple is said to have been built in the 17th century when Jijabai, the mother of Maharaja Shivaji, was given the idol of Lord Ganesha which was unearthed by a statesman of the Maratha Empire. Since then, the temple has been a significant site for Ganesha celebrations. It is also said that on account of the presence of Kasba Ganapati Temple, Pune is also known as the city of Lord Ganesha. Today, the temple is a popular shrine in Pune and is visited by tourists in thousands. Located at Morgaon at a distance of about 50 km from Pune, Shri Mayureshwar Temple is one of the eight famous Ganesh temples in Maharashtra which are collectively called Ashtavinayakas. Therefore, it holds a prominent place in the hearts of Hindu devotees. The temple was built in the late Medieval Period and is considered as the most important Ganesh temple in the country. Therefore, it is a site of pilgrimage amongst devotees of Lord Ganesha.